Several days of unseasonably cold weather and torrential rains have increased the misery in the already miserable Gaza Strip, where 1.7 million Palestinians are besieged and blockaded by the Israeli Occupation authorities. The government estimates that 7,000 families have been harmed (likely meaning 35,000 persons, most of them children). Because of flooding, over 5,000 persons have had to be evacuated from their homes, where they were trapped by rising waters. They have been taken to shelters around the Strip. About 100 persons have been injured by the storms and floods, a handful of them seriously, and there have been some deaths, especially of children. The government is estimating that the 4-day storm of rain mixed with snow has done $64 million in damage, according to Alarabiya. The Palestinians have had to deploy fishing boats in the rescue effort because they have been prevented from bringing in proper rescue equipment. Dozens of the boats can be seen ferrying families whose buildings had been flooded or even destroyed. Thousands of people remain trapped in buildings by the floodwaters. Some 76 walls have been destroyed by the flooding, 51 billboards, and 12 trees were uprooted by the violent winds, and hundreds of automobiles have been washed away. The Palestinian government is calling on other countries to send the kind of equipment needed to deal with this catastrophe. Israel limits the import into Gaza of building materials and construction equipment, alleging that these have potential military use. In fact, it is the policy of Tel Aviv to impose collective punishment on Palestinians in Gaza in hopes of unseating the Hamas government that came to power in free and fair elections in 2006. This creepy and evil Israeli policy is backed to the hilt by the United States government, which also bears major responsibility for the straits of the Gaza civilian population. Half of Palestinians in Gaza are children, who are the primary victims of the Israeli blockade. Because of the Israeli blockade, which not only limits imports but prevents most exports, the building and health infrastructure of Gaza is extremely feeble. There is also a fuel and electricity crisis. Israel is blocking the import of inexpensive fuels, and only allows in expensive high-grade fuel, which Palestinians in Gaza cannot afford to buy because Israel won’t let them export anything they make and won’t even let them fish properly. As a result, Gaza’s sole electricity plant has been idle for 6 weeks, and water purification plants had already ceased operating. During the unusually cold weather and flooding, for people to have no way to keep warm because the electricity is out is particularly cruel. The specter of high infant mortality from diarrhea and dehydration looms over Gaza, as does the threat of cholera outbreaks. Sheikh Tamim of Qatar announced that he wanted to send $32 mn. worth of fuel and $28 mn. worth of goods useful in fending off the cold. It remains to see if the Israelis will let these donations into the Gaza Strip. The Palestinian government in the West Bank is also hoping to send in fuel and other supplies through the Israeli checkpoint if it opens on Sunday. Palestine President Mahmoud Abbas called on Arab League Secretary-General Nabil Fahmy to send fuel and supplies urgently. As displaced families crowded into schools and mosques, many Palestinian families announced on Facebook that they had room to host another family in their own apartments. 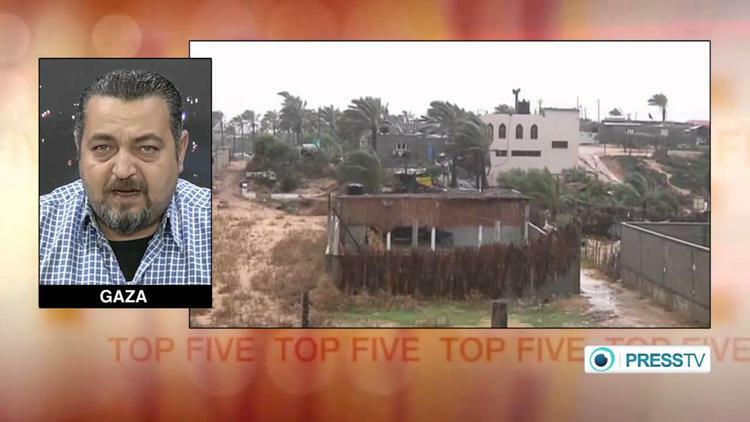 The cold snap, storms and flooding are expected to be a disaster as well for Gaza agriculture. Since the Israeli blockade had already rendered 56% of the Palestinians there food insecure and caused widespread anemia in children and expectant mothers, the further shortfall in food production could be calamitous. Israel, which has sent emergency aid teams to disaster areas like Haiti and the Philippines, so far is more like the earthquake or typhoon itself for the hapless residents of Gaza, most of them refugees from what is now Israel whose families were expelled from their homes by Jewish settlers in 1948. As for Americans’ support for keeping nearly 2 million Palestinians in a concentration camp, most people in the region want to know what makes them so cruel.